If we let m, and m2 be the limits of uncertainty in measurement m, then corresponds to the width, Ai.m, of the attitude uncertainty band on the celestial sphere. Thus,"
If the measurement density is low (i.e., if the spacing between loci is large), a small measurement error will result in a large shift in the measured attitude and a small measurement uncertainty will produce a wide attitude uncertainty band, A Lm, on the celestial sphere. In addition to the width of the two attitude uncertainty bands, the size of the parallelogram of intersection is determined by the angle at which the two loci intersect, called the correlation angle, 0. (A more formal definition of 0 will be given in Section 10.4.) Thus, for any two measurements, e.g., fi and if, the attitude uncertainty corresponding to these measurements is determined by three factors: (1) the measurement uncertainties, Up and Uv, (2) the measurement densities, dp and dq, and (3) the correlation angle between the loci, ®v/p. For given measurement uncertainties, the measurement densities determine the widths of the attitude uncertainty bands and the correlation angle determines how these bands will combine to produce an overall attitude uncertainty. Thus, attitude accuracy analysis for pairwise measurement combinations may be reduced to determining the various measurement densities and correlation angles. Specific formulas for transforming these parameters into measures of the attitude uncertainty (i.e., the size of the error parallelogram) are given in Section 11.3. Although there are many types of attitude sensors (e.g., Sun sensors, horizon scanners, magnetometers), the analysis of attitude measurements can be greatly simplified by classifying them according to the shape of the corresponding loci of possible attitudes. Thus, we will say that two attitude measurements are of the same type if and only if the attitude loci corresponding to the two measurements have the same shape, i.e., if both loci satisfy parametric equations of the same form. Although the number of attitude sensors and measurements, is large, these measurements correspond to only a few basic types. The two most fundamental types of attitude measurements are: (1) arc-length measurements from a known reference vector, such as the Sun angle measurement of Fig. 10-1, and (2) rotation angle measurements about the attitude between two known reference vectors, discussed further in Section 10.3. In addition, there are some compound measurement types (such as the rotation angle from the Sun to the Earth's horizon, as described in Section 10.5) that are not as well understood. A second example of an arc-length measurement is the Earth width, Q, or the rotation angle about the attitude between the two Earth horizon crossings for either a rotating sensor or a-fixed sensor mounted on a spinning spacecraft. 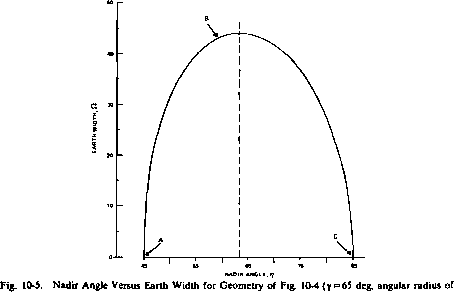 A given Earth width implies that the nadir angle, i), between the attitude and the center of the Earth must have one of two possible values, as shown in Fig. 10-4. Thus, although the Earth-width measurement is a rotation angle, it is classified as an arc-length measurement because the resulting attitude loci are small circles. Fig. 10-4. A given Earth width, Q, results in two possible nadir angles, 7|, and tj, corresponds to the scanner scanning "above" the center of the Earth (C- C) and ij2 corresponds to the sensor scanning "below" the center of the Earth (B-B). This gives two sets of loci, and for the possible position of the attitude, y is the fixed angle between the horizon sensor and the spin axis. The Earth-width measurement is more complex than the Sun angle measurement in two ways. First, as mentioned above, a given Earth width corresponds to two possible, discrete nadir angles. As illustrated in Fig. 10-4, a given Earth width, Q, can correspond to the two horizon crossing points, C. As the points move about the perimeter of the Earth's disk, point A traces out the locus, L^, of possible attitudes at a fixed nadir angle, tj,, from the Earth's center, E. However, the same value of $2 can also correspond to horizon crossing points at B. In this case, the locus of possible attitudes is Lw with nadir angle 7j2<7j,. where E and p are the position and angular radius of the Earth, and y is* the mounting angle between the sensor and the attitude. from nadir angles at A, B, and C are labeled on Fig. 10-6. angle from the attitude to the horizon sensor and p is the angular radius of the Earth's disk. 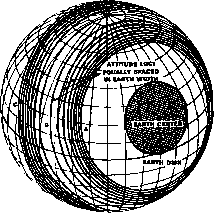 The physical interpretation of the measurement density as the density of loci on the celestial sphere is clear from the figure. When the attitude is near the A or C loci, the measurement density, da, is high. (Compare with Eq. (10-4) and Fig. 10-5.) Here, an uncertainty in Q of 5 deg corresponds to only a small uncertainty in the attitude, ALa, and the attitude uncertainty band will be narrow. In contrast, when the attitude is near B, the Earth-width measurement density is low and a shift in fl of 5 deg corresponds to a large uncertainty in the attitude. The numerical form of the curve plotted in Fig. 10-5 and of the density 9Q/9tj are given in Section 11.3. Fig. 10-6. Attitude loci equally spaced in Earth width for conditions of Fig. 10-5. A, B, and C correspond to the similarly lettered points on Fig. 10-5. The measurement density, </q, is high near A and C and low near B.
above the spin plane is equivalent to an arc-length measurement of the attitude relative to the star. A single magnetometer reading, in a known magnetic field, measures the arc-length distance between the magnetometer axis and the magnetic field vector. Most observations involving a single, known reference vector are arc-length measurements. Fig. 10-7. Standard Notation for Attitude Angles. 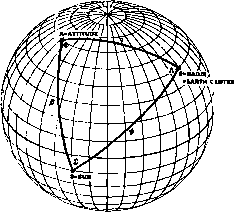 4> is the rotation angle about the attitude between the Sun and the Earth. reference vectors are the Sun and the center of the Earth,* although they could equally well be any two points of known orientation in the sky. The geometry here is more complex than in the case of the constant arc-length measurements. 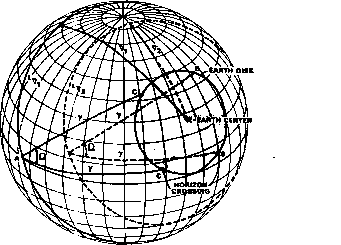 Specifically, a fixed rotation angle, 4», about the attitude between the Sun and the center of the Earth implies that the single-axis attitude lies on a curve with two discrete segments on the celestial sphere. Representative plots of these curves of constant $ are shown in Figs. 10-8 and 10-9 for an Earth-Sun separation, <p, of 30 deg. 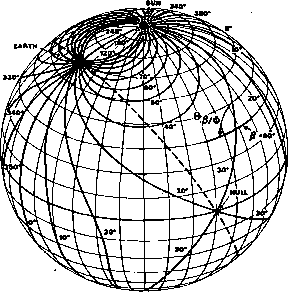 The curves overlying the coordinate grid are the lines of constant For example, the curve labeled "40°" covers all possible orientations of the spacecraft attitude such that the rotation angle from the Sun to the Earth (about the attitude) is 40 deg. Thus, the set of constant <J> curves has the same relation to the rotation angle measurement as the set of all small circles centered on the Sun has to the Sun angle measurement. The five views in Figs. 10-8 and 10-9 are centered at varying Sun angles, /3, and azimuthal angles relative to the Earth-Sun great circle. The rotation angle curves are plotted in 10-deg intervals, except that curves between the Earth and Sun for rotation angles between 120 deg and 240 deg have been omitted because of the high measurement density in that region. In Fig. 10-9(c), 25- and 35-deg rotation angle curves have been added as dotted lines to show the shape of the curves in the region of the null, or Sun vector/nadir vector cross product. 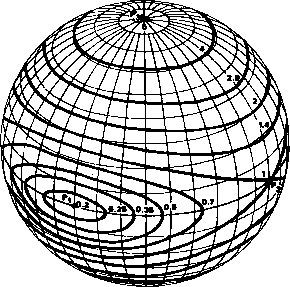 The null will prove to be an important reference vector for many aspects of Sun-Earth-attitude geometry. Fig. 10-8. Rotation Angle Geometry for a 30-Deg Sun-Earth Angular Separation. View centered at /?=>60 deg, azimuth = 60 deg from Earth-Sun great circle. * The center of the Earth is a known reference vector, but a horizon crossing is not. This is discussed in detail in Section 10.5. Fig. 10-9. 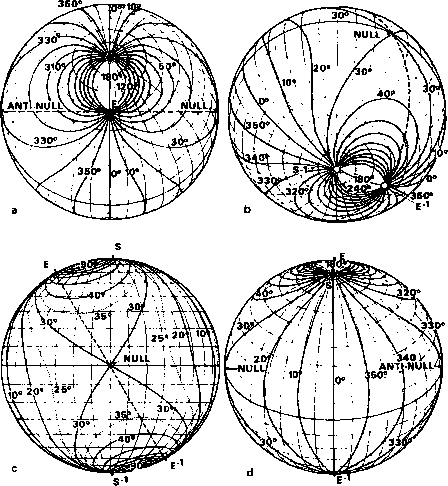 Different Views of Rotation Angle Geometry for a 30-Deg Sun-Earth Angular Separation. Views centered at p, azimuth coordinates of: (a) 30 deg, 0 deg; (b) ISO deg, 60 deg; (c) 90 deg, 90 deg; and (d) 60 deg, 180 deg. The general character of the rotation angle curves is evident from the plots. As can be seen most clearly in Fig. 10-9(a), the great circle containing the Earth and the Sun divides the celestial sphere into two hemispheres. All rotation angle curves between 0 deg and 180 deg are in one hemisphere and all curves between 180 deg and 360 deg are in the other. In addition, the 30- and 330-deg rotation angle curves (i.e., the curves with 4> = i/') divide each hemisphere into four quadrants, as can be seen in Fig. 10-9(c). Each rotation angle curve (except those of 30 deg and 330 deg) consists of two noninterseaing segments in opposite quadrants of one hemisphere (Fig. 10 9(c)). All segments start and end on the Earth, the Sun, the zenith (£"'), or the antisolar point (S ~ '). In contrast to the uniformly distributed small circles of /? and tj (i.e.. dp=dv = I), the rotation angle curves are characterized by their greatly varying density. For <¿<<90 deg, the rotation angle density | V<J>(a, fi)|, S and E fixed) is greatest between the Earth and the Sun (and between the zenith and the antisolar point) and approaches zero as a limit in the region of the null or the antinull. Recall that a low rotation angle density means that a small change in rotation angle corresponds to a large change in attitude. Figure 10-9(c) shows that a change of only 5 deg in rotation angle from 30 deg at the null to either 25 deg or 35 deg corresponds to a shift in attitude from the null to a point over 30 deg of arc away. Thus, the region around the null or the antinull will yield poor attitude solutions based on the rotation angle measurement, because a smell uncertainty in rotation angle corresponds to a large uncertainty in the attitude. Similarly, for the geometry of Figs. 10-8 and 10-9, the area between the Earth and the Sun (or between the zenith and the antisolar point) will result in particularly good attitude solutions from rotation angle data. Expressions for the rotation angle density, which may be used to quantitatively evaluate the attitude accuracy, are given in Section 11.3. Figure 10-10 shows the rotation angle curves for an Earth-Sun separation of 90 deg. In general, the rotation angle curves have become more uniformly distributed over the celestial sphere, although a large region of low density remains in the vicinity of the null and the antinull. When the angular separation between the Earth and the Sun is greater than 90 deg, the geometry is equivalent to that of separations of less than 90 deg with the location of the Earth and the zenith interchanged. Thus, the geometry for the 30-deg angular separation shown in Figs. 10-8 and 10-9 is equivalent to the geometry for a 150-deg separation with the zenith and Earth interchanged.